ST. ANDREWS, SCOTLAND — Two-time Masters champion, Tom Watson, made an official announcement on Wednesday, July 15, that 2016 will be his final trip to Augusta National to compete in the Masters, citing a decline in skills as the reason. Source: pga.com. “When you get to that position in your career, you’re just hoping to make it to Sunday, then it’s really time to hang them up,” Watson said. “With that said, I’m just going to make the announcement that next year’s Masters is going to be my last Masters. I am not going to play any more after that. Even though I will be eligible to play, I won’t play. The golf course is too big for me, and with my declining skills and length, I won’t be playing that. Tom Watson is a pro PGA golfer who now plays mostly on the Champions Tour. He is also regarded as one of the greatest links players of all time. Watson was announced as the captain for the 2014 Ryder Cup in Scotland. Watson is also a popular motivational speaker and keynote speaker. He is available for celebrity golf tournaments, charity fundraisers, personal appearances, endorsements & corporate events. 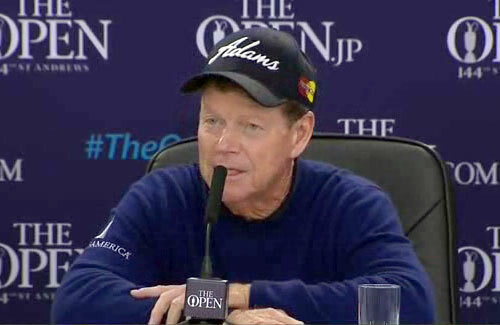 If you would like to book Tom Watson for a speaking engagement, personal appearance or product endorsement, you can contact PFP Sports & Celebrity Talent Agency for Tom Watson booking agent information.